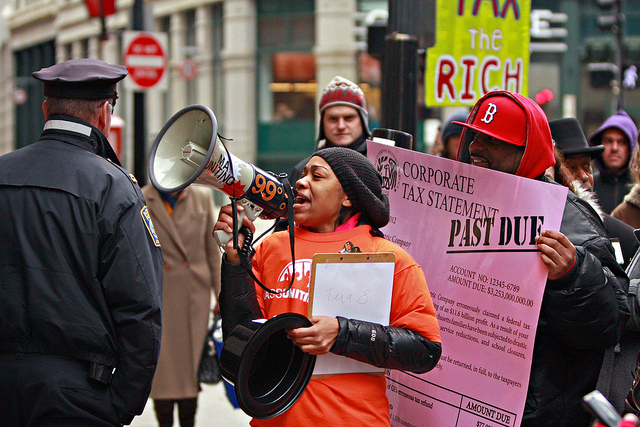 The tax marches held across and beyond the US on April 15 were an opportunity to focus on the alarming implications of proposed US tax reforms for inequality and human rights, both in the US and abroad. Hundreds of tax marches took place across the US and in countries around the world on April 15 to demand that President Donald Trump release his tax returns, as well as to push for fairer and more progressive tax policy. The biggest planned mobilizations since the global women’s marches that marked President Trump’s inauguration in January, they were organized against the backdrop of proposed reforms to the US tax system which would have severe consequences for economic and social rights domestically and internationally. President Trump’s tax plans vary slightly from the blueprint put forward by House Speaker Paul Ryan, yet the differences are far outweighed by their similarities. Both pair sharp cuts to top-end personal income tax rates with a swift drop in corporate tax rates, increased taxes on consumption and what is effectively a boost in the US’ role as a global tax haven. While neither of these proposals has yet been presented to Congress, both are anticipated to widen economic inequality and leave yawning chasms in the revenue base and therefore severe reductions in public services and protections on which millions of ordinary people depend. The US is already one of the most economically unequal societies in the industrialized world, yet almost 80 percent of the net personal tax cuts proposed would go into the pockets of the richest one percent, whose income share has been growing exponentially since the 1980s. The Trump-Ryan tax reforms would also radically rewrite how, and how much, corporations are taxed. Far from being over-taxed, US companies contribute relatively little compared to other G7 countries in actually financing public services. Despite the headline 35% rate, US companies – through successful lobbying and using tax loopholes and incentives – pay on average 14 percent in corporate income tax, with around two-thirds of companies, especially the very profitable ones, paying no federal income tax at all. As a result, low-income workers pay proportionally more in tax than corporations that make billions of dollars in profit, while the tax base is depleted. The leading proposal would only deepen the problem. The so-called Destination-Based Cash Flow Tax (DBCFT), also known as the border adjustment tax, would scrap the corporate income tax altogether, and replace it with what is, in effect, a consumption tax with wage subsidies. This new tax would most likely shift the tax burden from companies onto consumers, especially in the first years. Poorer families, especially women heads of household who bear more of the consumption burden in the US, would be footing the bill simply because they spend a larger share of their paychecks toward purchasing necessities which are often imported. For the poorest 10 percent of households surviving on only $12,000 per year this new consumption tax is estimated to cost $600 a year – no small sum for families living in poverty. What’s more, the DBCFT will almost certainly not be avoidance-free. Tax experts are already envisioning how companies could simply shift their point of sales (as they now shift their point of profits), or how import companies could simply acquire export companies to offset any need to pay tax at all. This is a critical failure, as the DBCFT is supposed to serve as the lynchpin to offset the fiscal losses of massive tax cuts for the rich. Seen together, the significant reforms to the US personal income and corporate income tax regime would radically alter who pays for what public services in the US. At a time in which key public services around the US are both overburdened and severely underfunded, the Trump-Ryan tax plans would, if implemented, strip the public purse of an estimated $3 trillion in revenue over 10 years, with reforms to healthcare and the undermining of the Internal Revenue Service threatening yet deeper losses. Combined with the sweeping cuts outlined in Trump’s and Ryan’s previous budget proposals, these tax cuts are a recipe for the wholesale breakdown of already-depleted public services in the US, with deep impacts on the social and economic rights of already disadvantaged sectors of the population. These impacts will be particularly felt by low-income women and women heads of household. It has been well-documented elsewhere how disinvestment in public services increases women’s unequal burden of unpaid care work, restricting their rights to work, education and more. Existing programs in the US which go some way to alleviating or supporting care (e.g. Medicaid, child and elder care, food security and after-school programs) are explicitly targeted for cuts, while Trump’s proposal for new tax benefits related to childcare are wildly regressive, basically amounting to a tax cut for high-income families while doing very little for low-income families for whom childcare is a huge financial and time burden. At the same time, key provisions in the Trump-Ryan tax plans would drive even deeper wage and tax disparities between men and women. For example, Trump’s plan would eliminate the head-of-household status, financially punishing single parents – 90 percent of whom are women. Taken together with the threatened dismantling of the Affordable Care Act and the defunding of Planned Parenthood these plans will result in deeper gender inequality. The Trump-Ryan tax reforms also pose deep perils to economic and social rights beyond the shores of the US. Described by experts as the “ultimate move in the tax competition game,” the leading corporate tax reform proposal discussed above is designed specifically to poach the tax base and economic vibrancy of other countries. The knock-on effects of this unilateral move are predictable. Other countries, especially developing ones which rely more heavily on corporate taxes, would reduce their rates even further and increase tax privileges for corporations to compete for investment. To offset the decreased revenue, governments would likely increase regressive consumption taxes while further depleting funds for public services and poverty reduction measures. Therefore, the spillover effect of the proposed US tax reform would be endured by the poorest people in the world, not just the US. Ultimately, the DBCFT would quickly transform the US into the world’s favorite tax haven for multinational companies, compounding existing deficits in tax and financial transparency in the US. US corporate tax dodging is currently estimated to sap poorer countries of some US$100 billion each year, depriving them of resources that such countries sorely need to progressively realize economic and social rights. The DBCFT is also predicted to cause a devastating new debt crisis, due to the potential effects of a border tax on the price of the dollar. This could lead to 15-25 percent spikes in borrowing costs for low- and middle-income countries holding dollar-denominated debt. Such a crisis would likely result in harsh austerity measures, which would have predictably ruinous consequences for economic and social rights in affected countries. The Trump-Ryan tax plans, if enacted, would seriously undermine the ambitious commitments made by the international community to tackle poverty and inequality through the Sustainable Development Goals adopted in 2015, which are intended to be implemented in all countries. Target 10.4, for example, pledges to reduce inequality through fiscal policy, whereas these plans use fiscal policy as a tool to further concentrate wealth and would deepen disparities in outcomes and opportunities. On a global scale, the proposed reforms would compound the effect of drastic cuts announced to US development assistance and the so-called ‘Global Gag Rule’. Viable alternatives to these regressive reforms abound. Tax experts, lawmakers and advocates consistently point to more effective ways to raise revenue in equitable ways, such as countering corporate tax abuse. Moreover, putting in place fair and progressive tax systems is an integral part of states’ obligation to generate the maximum of their available resources to realize economic and social rights and tackle inequality. CESR has been invoking these human rights duties to challenge unjust tax policies and the deprivations they cause in countries across the globe, working in common cause with human rights, tax justice and development allies worldwide. Increasingly, UN human rights experts have reminded all governments that their tax and budget policies should be guided by human rights principles. International human rights bodies have begun to hold wealthy tax haven countries accountable for the harmful impact of cross-border tax abuse. For example, Switzerland’s corporate taxation and financial secrecy policies were recently challenged by the UN Committee on the Elimination of Discrimination against Women, after CESR and partners including the Tax Justice Network submitted evidence to the Committee that these policies were depriving poorer countries of billions of dollars in tax revenue, hitting women hardest because of the cuts in public services and social protection measures which usually ensue. As the world’s largest economy, few countries’ tax policies and practices have as far-reaching an impact on human rights and sustainable development worldwide as those of the US. The proposed US tax reforms effectively represent a further redistribution of wealth away from the world’s poorest and into the hands of a tiny and predominantly male elite of the US' extremely rich. Mobilizing against any tax reforms that would exacerbate the global inequality crisis and undermine human rights in the US and abroad should therefore be a matter of worldwide concern. It is for this reason that CESR, as an international human rights organization, was one of scores of civil society organizations supporting the tax march in the US and around the world on April 15. Beyond the issue of Trump's tax returns, the march's purpose was to stand together to uphold the common values of fairness in taxation and transparency in fiscal governance. Its unifying principles and demands include a commitment to a just economy that protects human rights over corporate privileges. Wherever you are, we hope you will join us in mobilizing towards this goal.